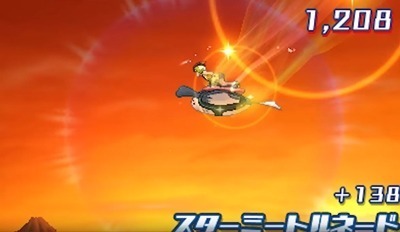 Mantine Surf is another new feature added to Pokemon Ultra Sun and Moon, a mini-game where your skills are put to the test with surfing as you compete for points. You can begin playing this mini-game after completing the first island. During Mantine Surf you’ll encounter various obstacles as you fight for points, namely Tentacool, Sharpedo, Waillord and rocks. Obtaining high scores will earn you BP to spend. So let’s get surfing! Lanturn 360 Bonus points on taller waves. Up, Down, Up Reach 1st Place in 1 Beach. Primarina Twist Bonus points on smaller waves. Down, Down, Down Reach 1st Place in 2 Beaches. Starmie 720 – Right, Left, Right, Up Reach 1st Place in 3 Beaches. Over-the-Gyarados Loses value if repeated. Up, Right, Down, Left After getting Surfing Pikachu. If you spot a small wave, pull off the Primarina Twist and land it. The Primarina Twist has extra points when done on small waves. And if you land it, you also get a landing bonus which is useful in winning the Mantine Surf per island. If riding a tall wave, perform the Lanturn 360. The Lanturn 360 gains extra points on tall waves. Along with this, combo it with other basic moves such as the left roll, right roll, back flip, front flip. Or for those who are more gutsy, try chaining the Huntail/Gorebyss Spiral. When you see you and the Mantine covered in a golden aura, perform the Starmie 720. The golden aura surrounding you functions as a speed boost which works well for the Starmie 720. Perform the Magikarp Splash and the Over-the-Gyarados only once. These two particular moves in Mantine Surf are hidden moves which lose point potency after being performed a number of times. Try performing them when you’re on a high wave for better chains.